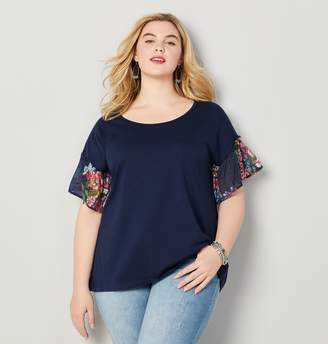 Style: 34514805 SKU: N/A Master wearing paisley print in this plus size top which features intricate paisley design cascading down into a leaf print. 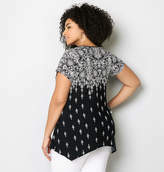 The allover design is complemented by a sharkbite hemline, ready to be paired with jeans, leggings or ponte pants for a casual day out and about. 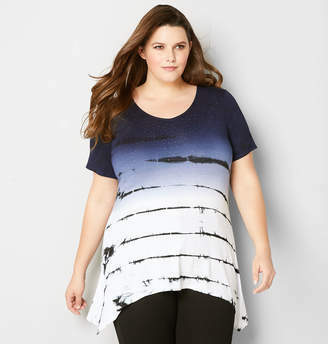 • Plus size top. • V-neckline. • Short sleeves. • Polyester/spandex. Machine wash. Imported. • Approx. 28 1/2 inches at shortest point. Approx. 32 inches at longest point.